You set the time and we’ll meet the deadline. All of our translators are experienced professionals specialized in the subject matter they translate. Our Company offers very competitive rates and grants volume discounts. We take into account repetitions found in source texts providing our clients with considerable savings. Directum Translations® is the leading company in Mexico specialized in translation services. Our Company translates legal, financial, and technical documents, among others. No matter what documents you need to translate, we have you covered. 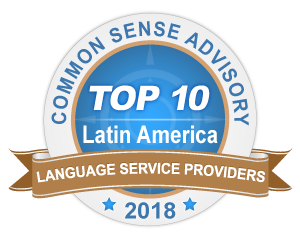 The 2018 annual survey of Common Sense Advisory ranked us in first place in Mexico among the largest Language Service companies in Latin America. No need for upfront payments or deposits when ordering your translation. We answer our client’s quote requests immediately. We work together with our clients to understand their needs and thereby ensure full satisfaction. Unlike most companies engaged in language services that are composed of a network of freelance translators Directum® Translations has its own internal team of translators. Our quotes specify the exact amount that will be invoiced. There are no unexpected or last-minute charges. We can sign non-disclosure agreements to guarantee your peace of mind and trust. We translate corporate, legal, financial, and technical documents of any kind. We have capacity to translate high-volume, complex projects with short turnaround times. We translate to and from English, Spanish, German, Japanese, Portuguese, French, Italian, Russian, Mandarin, Hebrew, among other languages. We work hand-in-hand with our clients and assist them in reviewing the documents they’ve had translated or by making any necessary changes that their documents are subject to, during the drafting and negotiation process. Our team of translators consists of experienced professionals specialized in the subject matter they translate. Our operations department is in charge of distributing projects with efficiency in order to meet your deadline. Our Project Managers are in constant communication with our clients to immediately address any comments, doubts, or important issues we need to keep in mind for their projects. Our advisors are always available. Thanks for contacting us, we are reviewing your information.